Ryan was born in July, 2006. Here he is at 3 1/2. 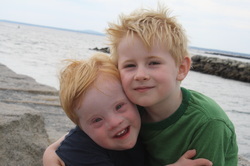 His brother, Colin, was six. He has 16 aunts and uncles and 15 adoring cousins. Ryan came into the world with a (firecracker) bang -- six weeks premature and weighing four pounds. He was home in a week and caught up quickly. Ryan's favorite thing to do is play with balls -- small balls, big balls, basketballs, soccer balls -- any ball he can get his hands on. He likes trucks too. He's very social and yells out his classmates names when he sees them. He loves to hug -- and he is an equal opportunity hugger -- if he asks you for a hug he will then tell you to hug whoever else is in the room too. Ryan loves the Wonder Pets, Max and Ruby and Ni Hao Kai Lan. He knows everyone's names -- his accent for Kai Lan's grandfather -- Ye Ye -- is hysterical. Ryan is getting some birthday practice in June with an early birthday cake with Grandma from Virginia (and John, not pictured) and Colin. Ryan turned 4 on 4th of July. He is showing his patriotism on the morning of his birthday. We went to Maine for two weeks in August. It was so nice - - the weather was beautiful, we had fun at the beach, in town at the candy store and other stores Ryan loved to wander into and say hello, and hanging with some of our cousins. Colin and I joked that some of the stores should have a picture of Ryan with a big X through them out front since he loved to get his hands on EVERYTHING. Colin was a good watcher. Ryan mostly loved just saying hi to unsuspecting shoppers. This was our last day -- we were collecting rocks to take home to paint. 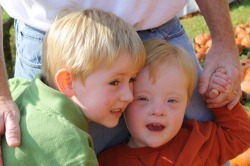 Ryan kept saying "camera" and "cheese" and hugging his brother and smiling. He was really in the mood for a photo shoot. 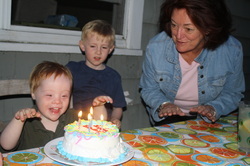 Ryan was spoiled rotten by his cousins on vacation with us in Maine. He loved yelling out their names over and over. He also loved swimming in the ocean. He would throw his head right into the waves. He had strangers cracking up at him. 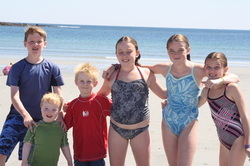 Pictured are Brendan, brother Colin, MaryKate, Tara and Eileen. I forgot to get a first day of school picture. 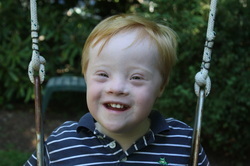 So this is Ryan a few days before school started in the backyard on the swing (a favorite!) 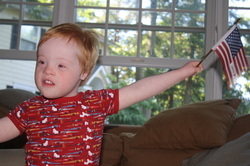 -- we needed a few shots of him by himself to bring to school to use in his cubby and other spots around the classroom. He walked right into preschool like the mayor this year. It was so nice to see after a tough transition to starting preschool last year. (who can blame him really) He loves school now -- especially yelling out the names of his teachers, therapists and friends. He is very nosy when he walks down the hall -- he stops to check out what is going on all around him. He is not adverse to sitting down for a rest either. He gives his OT the hairy eyeball sometimes when asked to perform some fine motor tasks but other than that they tell me he loves school and all his activities. He really likes the bumblebee song they sing at the end of the day too. He gets in the car and says "catch bee".